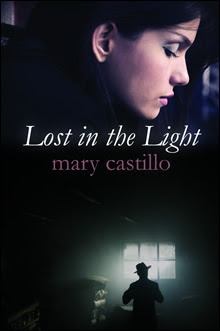 The Latina Book Club congratulates author Mary Castillo on her new book released this week. LOST IN THE LIGHT is an emotional, thrilling paranormal mystery which readers will enjoy wholeheartedly. BOOK SUMMARY: One October morning in 1932, Vicente Sorolla entered the white house on the hill and was never seen again. Now, Detective Dori Orihuela helplessly witnesses his brutal murder in her nightmares. Settling into a 120 year-old Edwardian mansion, Dori restores her dream home while recovering from a bullet wound and waiting to go back on duty. But then one afternoon, Vicente materializes out of her butler's pantry and asks her to find a woman named Anna. Dori wonders if she's not only about to lose her badge, but also her sanity. ABOUT THE AUTHOR: A lifelong professional writer, including a stint as a reporter for the Los Angeles Times Community News (second best job in the world), Mary Castillo is the proud author of three novels (SWITCHCRAFT, IN BETWEEN MEN and HOT TAMARA) and three novellas featured in the anthologies, ORANGE COUNTY NOIR, NAMES I CALL MY SISTER and FRIDAY NIGHT CHICAS. Her latest book, a paranormal that goes back and forth between modern day and Prohibition, LOST IN THE LIGHT is now available. To learn more about Mary, visit her at www.marycastillo.com. Follow her on Twitter at @mcastillowrites and on Pinterest.